Kimono are Japanese robes that are fastened around the waist with a wide cloth belt known as an obi. They may be made of very colorful fabric or a solid colored fabric, and they are a traditional type of Japanese clothing. Making a kimono for a doll requires some experience with sewing. Measure the distance across your doll's chest and from its shoulders to its ankles. Cut three strips of fabric that match the measurements that you have just taken. These will be the body panels. Measure the length of your doll's arm. Measure the distance from the shoulder to where you want the kimono sleeves to fall. Kimono sleeves come in varying widths, some of them fall to the knees or lower, while others barely fall to the waist. Double the measurement that you found in Step 4. Cut two strips of fabric using the measurement from Step 3 for the width and the measurement from Step 5 as the length. Designate one of the body panels that you have created as the back. Place a second body panel on top of of back panel, the pattern side of the fabric facing inwards. Measure the distance from your doll's shoulder to the neck. Sew in the shoulder of the kimono by sewing the measurement that you found in Step 9, starting at the upper right corner and sewing towards the center. Sew in the shoulder of the kimono by sewing the measurement that you found in Step 9, starting at the upper right corner and sewing toward the center. Flip body panel away from the back. Line up the third body panel against the back, the patterned side facing in. Repeat step 10, only sewing from the upper left corner toward the center. The right and left panels will overlap, but that will be taken care of later. Stretch the sewn body panels out so that you have the patterned side facing up on all three pieces. Fold one sleeve piece in half right side out, the way that it will hang off of the doll's arm. 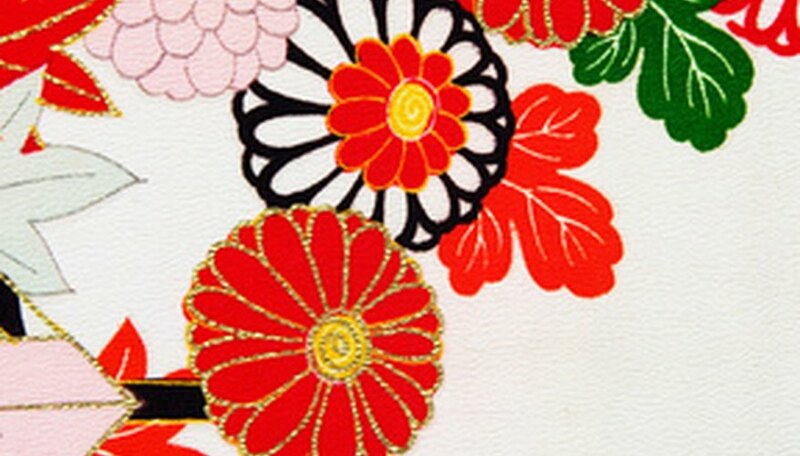 Make a small pencil mark on the fold line on the inside of the kimono. Line up the pencil mark to the shoulder seam of the kimono. Lay the sleeve flat on top of the kimono body. The long edge of the sleeve, with the patterned side of the fabric facing the fabric side of the body, should be lined up with the edge of the body panels. Measure the distance from the doll's shoulder to a point halfway between the doll's armpit and the doll's waist. Mark this measurement going up from the shoulder seam and then down from the shoulder seam. This will create the arm hole on the kimono, and it will be twice the measurement found in step 6. Sew the sleeve to the body between the two marks you have made. Repeat Steps 2 through 8 to attach the other sleeve. Fold the kimono from top to bottom at the shoulder seams with the patterned side facing inwards. You should now have a garment that is roughly shaped like a T.
Sew the bottoms of the kimono sleeves together. Sew the loose edges of the kimono sleeves that are the closest to the body panels to each other. Sew the two front panels of the kimono to the back panel underneath the sleeves. Turn the kimono right side out. Put the kimono on your doll. The right side of the kimono should be wrapped around the doll's body, with the left side going over it. Take the kimono off of the doll. Hem all raw edges by folding them under twice and stitching them down. Measure around the doll's waist. Add enough space to glue down a Velcro fastener. Measure the distance from the doll's waist to a point halfway up its chest. Cut a strip of contrasting fabric using the measurement for Step 1 as the length and Step 2 as the width. This will be the obi. Hem the strip of fabric. Glue a small patch of Velcro fabric to the patterned side of one end, and the corresponding patch of Velcro “hook” to the plain side of the other end. This will allow you to wrap the belt around the doll's waist and to fasten it. Put the kimono on the doll and secure it by wrapping the obi around the doll's waist underneath the sleeves.